Love in Action Week: Helping new mothers. This was a tough year for so many people around the world. Before all of the noise begins that can come with the holiday season, we wanted to figure out how we could step away from it, and choose a little different route. How can we transmit love and service this year and all year around? I have come up short many years in a row talking about what we want to do a little too late, and allowing every other distraction to rob us of the gift of time. So this year, in lieu of gift guides (maybe I will get to those later, maybe not), I wanted to share with you all some of the things we are doing as a family to put our love in action. I would be honored if you joined us. Also, you won’t want to miss the end of this week! Today I get to share with you a project very near and dear to me. New mothers are very close to my heart. I know how overwhelming it can feel when you first bring that baby home, let alone with little to no support. Gabe and I had very little when we first became parents, and every small thing we were given meant the world to us. I called our local women’s center that assists new mothers who don’t have any help starting off with their new babies. They give mothers support in many ways including diaper bags full of the essentials for their baby. They are in big need this year, so I promised to come up with some help. Here’s where you all can step in! 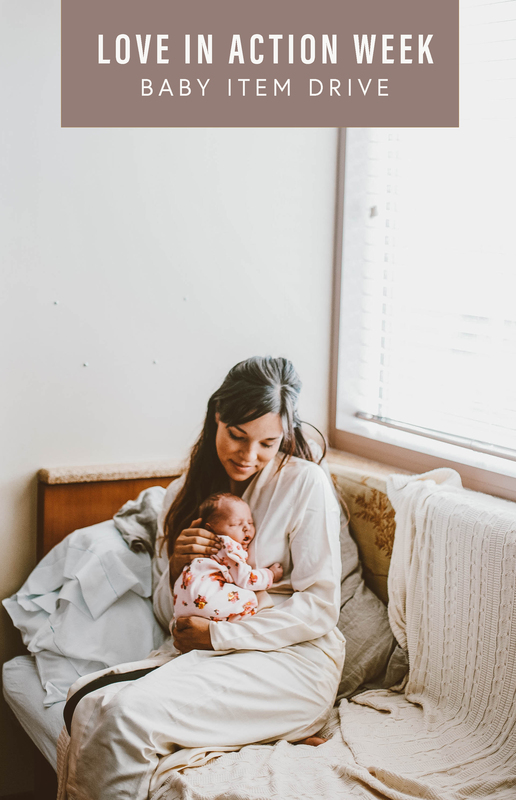 I created a Babylist registry with some items that I loved using with my little ones that I would really love to get to these mothers. If you would like to contribute, all items will be sent to my house for me to assemble the bags and deliver. Something to note! If you are able to contribute, some items will need you to enter an address to ship to us, which you can find under the “My Reservations” tab on Babylist. My goal is to fill 20 diaper bags to donate to the center. I have already had some companies step up to donate items to this diaper bag drive, and it completely moved me to see their generosity. Lily Jade is sending 20 leather essential cases to slip into the diaper bags that can hold some of the smaller baby care products. I have used their bags for years, and am always amazed by how much this company gives back! Freshly Picked – 20 new pairs of baby moccasins just arrived on my doorstep! These are the only shoes that ever stay on my little ones feet, and I am so grateful we get to these favorite baby shoes inside the diaper bags. Peekaboo Beans sent 20 sets of pajamas and sleeper sets for newborns! Their clothing is super thick and durable, and what my kids are currently living in. I am so excited to include these in the bags. It is so easy to feel a little dizzy with all of the ads, gift guides, and commercials that flood us this time of year. My hope is that this week we can link together to start a ripple of Love in Action by the way we serve our community, neighbors, and loved ones. Feel free to share this post with anyone you feel might want to join us. I’ll be sharing more about this on instagram over the next few weeks. Can’t wait to share what is next! Thank you from the bottom of my heart for being such an incredible community here on IHOD! Notes: The diapers on the registry are sizes 5 and 6 since the center is completely out of these sizes. The Beautycounter baby products are from my website, but any proceeds will also be going back to this drive to buy remaining needs. Photo by Chelsey Heidorn when Azelie was born. Anna, This is wonderful. My husband and I married our jounior year in undergrad. We trusted the Lord with his timing for children and by graduation I had a sweet baby boy on my hip. We were both pr-med with a LONG journey ahead, a tiny off campus apartment, and hardly anything to our names. That was almost 11 years ago now and we just finished the medical training and are awaiting the arrival of our fifth. There were so many needs that were provided for without our asking for those early babies. Tears come to my eyes just recalling some of the incredible gifts. One was about 10 bags of groceries from Walmart that someone hung on our car’s mirrors one day in our apartment parking lot. Inside were a pack of onesies and pjs that I had been eyeing for our firstborn we were waiting on. I hadn’t told a soul about them and they were the exact ones I was wishing for. No doubt there will be many little miracles in these diaper bags for mamas that are in need. Thank you! Oh gosh you are making me tear up. I remember similar first days as a mother. Small acts of love can carry the world if we let it! Thank you for this wonderful note. Love this idea! Just sent you something. FYI – the Bert’s Bees burp cloths are showing as “out of stock” on the Target website. Oh thank you so much for the heads up! I will update! And thank you for contributing. I know every little bit will mean so much to these mothers. Love this! I have been trying to figure a way to make an impact this holiday season and new mommas have been on my heart. Will def contribute and can’t wait to see all the blessings multiplied from this! Side note- have you ever heard of Mamas for Mamas? It’s a Canadian organization whose mission is to help new mothers and babies. I’ve been researching and recruiting my closest mom friends for advice on how we can make an impact like that right here in Atlanta. Just food for thought as you put Love in Action. There model seems to be having HUGE success and maybe has some content to inspire your next moves! Heather thank you so much for the note, I haven’t heard of it and I am curious now! Will look them up! This is amazing and heartwarming! My husband and I welcomed our first child 4 weeks ago and I’ve never felt so overwhelmed. I am so grateful for our tribe of family and friends who have helped generously over the past couple months and especially now. I can’t imagine what I would do without them. Noelle! Congratulations! How wonderful. I agree. It takes a village of support, and I am hoping this can reach each of these mothers that might feel all alone in this journey! Hi! I am not very far from you (I am also friends with the Lambert’s) and would love to help pack up gift bags if you need any! This is a beautiful idea. I am going to contact our pregnancy crisis center in Detroit area to do the same! What amazing people to donate too! Small acts of love are a true gift and REALLY make a BIG difference. THIS is exactly why you’re my favorite blogger. I’m looking forward to contributing to this cause. Thank you so much for your support Nicole!! That is so kind of you! What a wonderful idea! I would donate if the recipient wasn’t a crisis pregnancy center, but instead an actual medical clinic or women’s nonprofit (many women’s shelters and other non-partisan organizations give similar items to new moms this time of year). Unfortunately, as a public health professional I just can’t support this. Crisis pregnancy centers are not what they seem and actually do a lot of harm in communities! I hope next year you can find a less controversial organization to donate to. Hi Lauren, unfortunately there is so much misinformation about crisis pregnancy centers! Have you ever been inside one? I know as a public health professional you are probably told all kinds of things of how “harmful” they are. My sister is working for one in AZ, and the daily stories she tells me of these women that walk through the doors are heartbreaking. They are starting out as new mothers with little to no support. All they are doing is showing these women love and support and options for starting out as a new mother. As well as ways to get affordable care. It’s disappointing that it is considered “controversial” to do so. My sister has seen these womens completely change their lives as a result of someone who actually cared for them personally and their baby. The center I am donating to offers these essential needs for women who walk through their door with no financial means. There are no strings attached. There are no political agendas. Please feel free to email me if you would like to discuss! I definitely did my fair share of research before deciding to donate.